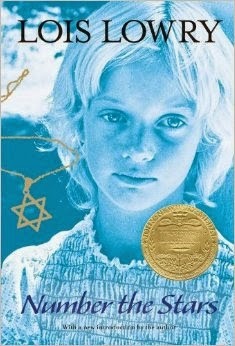 Number the Stars , by Lois Lowry is the selection for this month's edition of the Reading to Know Classics Book Club. Heather frin Don't Let This Universe Forget You chose this book for us to read and I am glad of it because I had never read it before. It is an easy, fast read and if you have any inclination at all to read it, I highly recommend that you do! It won't take you long and you will find it remarkably enjoyable/edifying/thought provoking. The story of Number the Stars , if you are unaware, tells us of a young girl named Annemarie who lives in Denmark during World War II. Annemarie's best friend is a Jewish girl who, during German occupation of Denmark, is being forced to "relocate." Annemarie's family, who are linked to the underground resistance movement, purposes to help their Jewish friends escape to Switzerland. The story is simple, straight forward and also quite short. Yet for as short as the story is, it is also impacting and memorable because it focuses on the theme of bravery even in the face of certain danger and even death. Number the Stars was written in 1989 so it's not been around for that long. Well. I guess it has been 25 years. Hmm. Does that make it a classic? I'm not terribly sure we can really call Number the Stars a classic, per se, but we can say that it met with instant acclaim. It was awarded the Newbury medal in 1990 and Lowry testifies to having received fan mail from parents who read this book when they were young and found it so impacting that they have taken great delight in sharing it with their children. It is at least safe to say that this book has seen a few generations of readers. Lowrey wrote the book following conversations she had with friends who related to her stories of what life was like during the occupation in Denmark. The character of Annemarie is based on a Danish friend of Lowreys who great up in Copenhagen in 1943. The question that the book asks is whether or not we, the readers, might also rise to the occasion and be brave if we were asked to be. Annemarie is just a young girl of ten (the age which this book is targeted to) and although she is used to seeing German soldiers on the street corners, she knows and understands better than to interact with them. They are a feature of her life but not something that she needs to rub up against, until the moment in time when they threatens a person and a family that she holds dear. Annemarie begins in this book as an innocent. She thinks to herself that she is "glad to be an ordinary person" who will not "be called upon for courage." Little does she know what the future holds for her. Ultimately, she is asked to work subversively to save the lives of others. Doing so requires a great deal of bravery. She must ask herself if she can face evil in the face and do what is right even if it threatened her life as well as those that she loved. I think this is a good question to ask ourselves and therefore I think this is a good book to read. What the world needs today are courageous people like Annemarie. (Specifically, what the world needs today are courageous Christians.) It seems to me that we Christians are so frightened of our own shadows that we can't bear to think that we might offend someone by making statements that we know to be true. We cower behind ideas of "diversity", "equality" , "acceptance" and "tolerance" because we know that those words do not include room for our positions or beliefs. It is very true that the idea of "being tolerant" does not mean anyone should feel tolerance for Christians. We Christians are bullied by others into sitting down and being quiet. In general, we tend tend to follow the public's cue and end up sitting by, watching people's lives fall apart all around us, simply because we are made to be afraid to share the truth that will set them free. Christians know what I am speaking of and non-Christians are just perturbed that I'm speaking at all. But it is very true that Christianity is the one and only thing not tolerated in this world today and it is the one and only thing that is needed to bring about true peace and reconciliation. We Christians really do need to pray for each other to be brave. And when one of us does take a stand, it would be great if the rest of us would - at the very least - be supportive instead of trying to put a little distance between ourselves and the one who took the stand for right. Being brave sometimes means taking the stand and sometimes it means showing solidarity with love for the glory of God. Annemarie has to make the same decision in this story. She must take a stand for herself and she must also support the obedient work of others. She chose admirably and therefore she is a character that is interesting to read and think about. Sometimes fiction can be greatly inspiring. Because of Annemarie's obedience to truth, the lives of several individuals (and - it can be argued - generations of people who followed after) were forever changed. If we speak up today and share the truth and the light of the Gospel of Jesus Christ then I suspect we would also see things change, one individual at a time. Future generations are also highly likely to be served when truth is upheld in this very moment. Annamarie refused to let evil win without doing and saying something against it, even though it was not a simple act she undertook. It is never simple when you stand for truth but it is always honorable and it always has an effect of some sort. We Christians fear the wrath and disdain of the general population which is ironic and unbelievable if you consider Who we say we believe in and Who we say we serve. Fear holds us back; faith pushes us forward. Belief that God is - in total fact - Who He says He is is vitally important to our own soul's health as well as for the health of others. Being brave is what Christians are called to be. The most wonderful thing is, that even if and when we find ourselves scared to stand up and say and do what is right, we can rest assured that He will give us the confidence necessary in the moment which we need it. Annemarie was able to be brave because she had the love and support of her family around her. When push came to shove, they were there to help guide her through the process. We, in turn, have a wonderful and loving God Who directs, guides and supports us as we walk through this tricky life. Truly we have nothing to fear because He has conquered sin and death already and on our behalf. We are free to be brave. It should be noted that bravery doesn't always involve grand spectacles. Most of the time bravery is displayed in quiet acts of sacrificial kindness. That is how it is displayed with Annemarie and most any story of bravery that I have ever heard of or witnessed. Discussing bravery shouldn't scare you off but fill you with hope and confidence in the One who will walk you through every situation you face and work things out for your good and for His glory. This is comfort for the Christian indeed! In the meantime, it is also great to read books - both fiction and non-fiction - which contain characters who have lived heroically and who will inspire you to live to the fullest every situation you find yourself in. Add this book to your reading list if you have not yet read it. It's a great story to be thinking about. Thank you, Heather, for choosing it for us. I actually got this one read too and my review is scheduled to post next week! Hurray! I also talked about her bravery, although I didn't get on quite the same soapbox you did. chuckle But it's a good and appropriate one, even if it DID step on my toes a little! I love that you took the book this direction. I was just talking to a friend recently about how "loving someone" somehow has become "letting them do what they want." It's terrible! That's not love it's cowardice! I love the different angles everyone uses to look at these books. That's why book clubs are the best! I'm waiting to read through this until after I have finished the book. I am liking it so far. I'm going to look for this at the library. And I love everything you said about bravery and our typical stance as Christians in this world today. I've been holding this i my feed reader until I finished the book, which I just did today. I agree with everything you said about the book, bravery, and the need for Christians to be brave today.